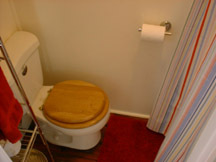 The toilet sits where the original toilet used to be. Back then the waste ran out a pipe onto the side of the tracks! (Don't worry, this one's hooked up to city sewer) There were no showers in old cabooses, but #34 now has a nice hot one. 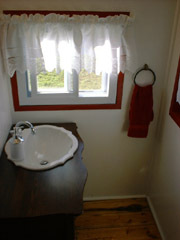 Sinks on the old cabooses were never this nice! 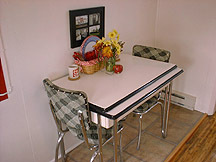 1950's dining table. Leaf slides out for additional table space. Two stools available for additional seating. 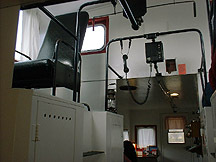 On the west side of the cupola we kept the original reversible seat and phone radio used by the conductor. Sit and see what a real conductor would while he rolled down the tracks watching all the cars ahead. 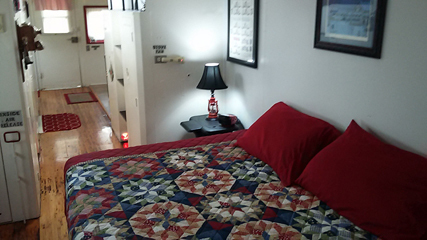 Queen bed sleeps two adults or 1 adult and a couple kids. TV/VCR with satellite hook-up on dresser. Original conductor's desk and chair in background. 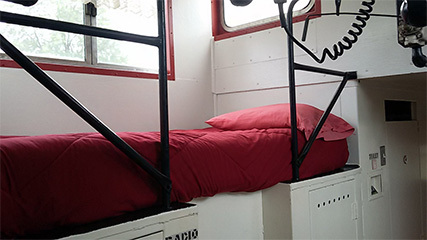 The caboose can sleep up to 4-5 people. Old dial phone on wall adds to your historic experience!